Alrosa Airlines, which is owned by the Russian diamond mining company Alrosa, has revealed to Russian Aviation Insider that the letter of intent it signed with the State Transport Leasing Company (GTLK) last week for two Russian-made Sukhoi Superjet 100s (SSJ100s), will help to finalise its jet fleet renewal programme. The carrier is not intending to target new markets with the replacement regional jets. At present its scheduled flights programme is largely covered by five Boeing 737NGs – two -700s and three -800s. However, there are a number of missions that do not match the 737’s range and capacity capabilities. In the 2018/2019 IATA winter schedule the airline will have to resort to its 26-year-old, 150-seat Tupolev Tu-154M tri-jet and even its 38-year-old, 72-seat Tu-134B-3. Alrosa is Russia’s last passenger carrier that is still operating the Tu-134 on scheduled routes. The airline’s representative says that the two SSJ100s will take over those missions currently operated by the Tupolevs and will therefore not go after new markets. “The SSJ100 does not cover distances above 4,000 km, so we are considering this [replacement] aircraft for the routes matching its range, or those with a technical stop where necessary. There’s simply no other aircraft available,” he further explains, pointing out that one of its two remaining Tu-154s was phased out last autumn, and the Tu-134 will be retired by next summer. “We are anticipating taking delivery of the SSJ100s before the 2019 summer season. 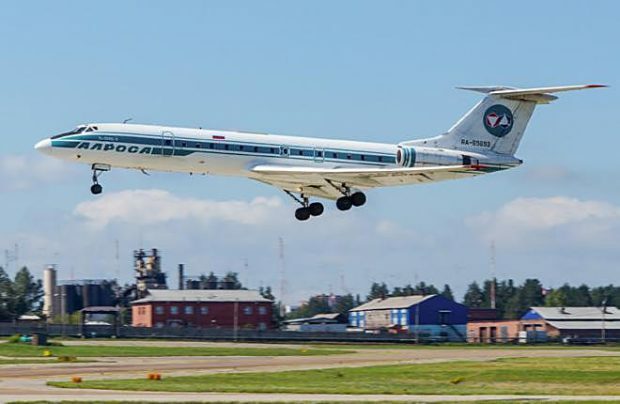 The new aircraft will operate on existing routes from Mirny and Novosibirsk and are intended as a replacement for the Tu-154 and Tu-134 aircraft that are to be be phased out and retired. Most importantly, the new aircraft will operate year-round flights to Polyarny, one of Russia’s northernmost airports, which serves Udachny, home to one of the diamond mining company’s divisions,” comments Alrosa Airlines’ general director Andrey Gulov.